In the 15th century the proprietors of Château de Beaulon began cultivating the property with different kinds of vines. In the late 17th century Bishop of Bayeux, the heir of Beaulon placed the Château in the hands of the Bishops of Bordeaux, who gradually introduced new vines as the years passed. This careful and rational choice of 9 grape varieties separated Château de Beaulon vineyards from the rest, remaining faithful to the region’s traditional vine assortment. 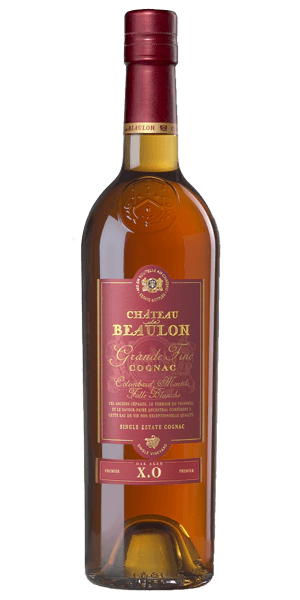 In 1965 a man named Christian Thomas acquired Château de Beaulon and all of its vineyards located in the heart of the most appraised cru of them all the Grande Champagne, where the soil delivers most delicate and elegant Cognac ideal for ageing. He dove right into the production and distillation of these one-of-a-kind vines as the Bordeaux Bishops had imagined, making the Cognacs from this house different and unique opposite the big players coming from the infamous cru Grande Champagne. Château De Beaulon 12 XO Grande Champagne is composed of Colombard and Folle Blanche wines and is aged in French oak barrels, usually twice the length of the minimum requirement for an XO Cognac. From the grape to the first drop all of the procedures are controlled to meet the standards, pleasing not only Bishops but perhaps, even, a Papal palate! What does Chateau De Beaulon 12 XO Grande Champagne taste like? The Flavor Spiral™ shows the most common flavors that you'll taste in Chateau De Beaulon 12 XO Grande Champagne and gives you a chance to have a taste of it before actually tasting it. The scent of Folle Blanche in the majority with hints of almond, cinnamon and peach. Intermediate dry palate with vanilla and nutty flavours, floral essences are there to be tasted also. A finish full of orange like freshness. Oak, Grapes, Floral, Vanilla, Fresh, Dry, Sweet, Orange, Walnuts, Caramel, Fruity, Apricots, Honey.